Transform the external appearance of your home with our affordable and top quality range of external PVCu soffits, fascias, guttering and cladding products. SGK Home Improvements provide a one stop shop if you are looking to refurbish the extra of your home with low maintenance PVCu, cladding and fascia products. . If your home suffers from rotting fascias, old leaking guttering, old woodwork or even flat roofs in need of restoration and repair, we can help. Maintenance free PVCu cladding and fascia solutions. We use only the finest PVCu building and cladding products meaning you can dramatically transform the exterior of your home with no more painting, staining or routine maintenance. Timber framed properties, old houses, properties with external cladding and many other types of homes can all benefit from the fascias we provide in PVCu. External walls, rafters and joists in your roof or gutters can all be made low maintenance and looking like new again. A choice of colours and wood grains. We offer standard durable white, black, brown and other colours to suit your property. Our products are designed to perform for many years and all come with long guarantees on quality, weather performance and our installation. When putting up new soffits or replacing them, the best option is to fit SGK PVC soffits. We will remove your old wooden and do not clad over the old material like some other firms. The cladding of existing rotting timber may trap moisture and cause problems in the future. We work with current Building Regulations that require ventilation in the soffits for new buildings (equivalent to a one inch gap along the whole perimeter). Ventilated soffits are also available. We remove the original timber soffits, repairing any rot in the ends of the rafter using a quality timber treated with preservative. We remove any old fixings as well as checking the eaves felt, if applicable. SGK Home Improvements provide Fascias and soffits with a 10 Year guarantee against fading and warping. 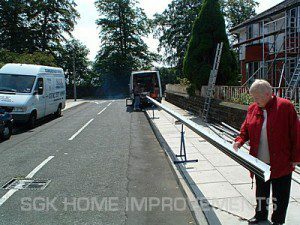 SGK also provide seamless guttering! We offer a unique seamless aluminium gutter system that is innovative and functional. 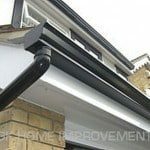 SGK Home Improvements use an extensive range of quality guttering to suit everyone’s taste and budget. 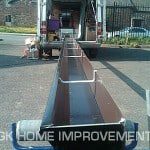 Guttering is available in various sizes from the standard traditional 112mm Half Round Guttering to the extra large 170mm commercial Guttering. Colours are available in standard White, black, brown and grey although many alternatives to these traditional colours are now available, with a 10 year guarantee. We also offer the latest in Woodgrain Floplast guttering that is ideal for projects which the fascia has a wood grain effect as they will match the profile completely. Our seamless gutters provide all year protection for your home. We offer a range of colours from popular black and white to other powder coated colours. 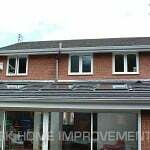 We can improve the external appearance of your home with our range of aluminium gutters. 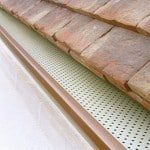 Our quality gutter systems are assembled on site by our trained installers. We offer a free, no obligation consultation on our wide range of soffits, fascias, cladding and other building products. Contact us to find out more.